It is uneasy to record the subtle penumbral lunar eclipse. Small brightness and color differences of the Moon can be easily lost by changing the film exposure, scanner setting or by improper image processing. It is necessary to calibrate all images to achieve good results. 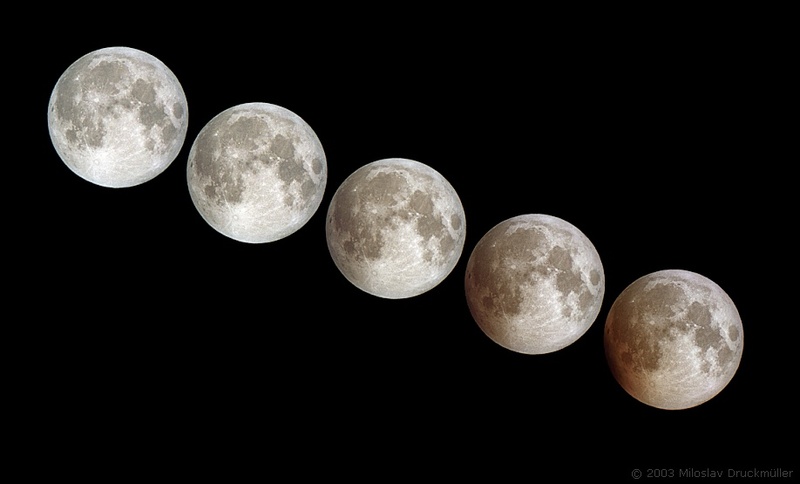 The sequence of images you are looking at was taken during the penumbral phase of total Lunar Eclipse on May 16, 2003. The start of penumbral eclipse was at 03:07 local time (01:07 UT). Three minutes later was the first picture of the sequence taken. The pictures follow in ten minutes time intervals. The last picture was taken at 04:00 local time (02:00 UT), three minutes before the umbral shadow touched the Moon. It is clearly visible that the penumbral shadow is of brown-orange color caused by the filtration of sunlight illuminating the Moon by Earth's atmosphere. If you look at the right limb of the Moon which is not influenced by penumbral shadow at the eclipse beginning you realize that the Moon as the whole is changing its color little bit from neutral gray to brown. This effect is caused by decreasing the Moon height above the horizon, i. e. again by filtration of the light by our atmosphere. In this case it is the filtration of the moonlight - sunlight reflected by the Moon's surface. 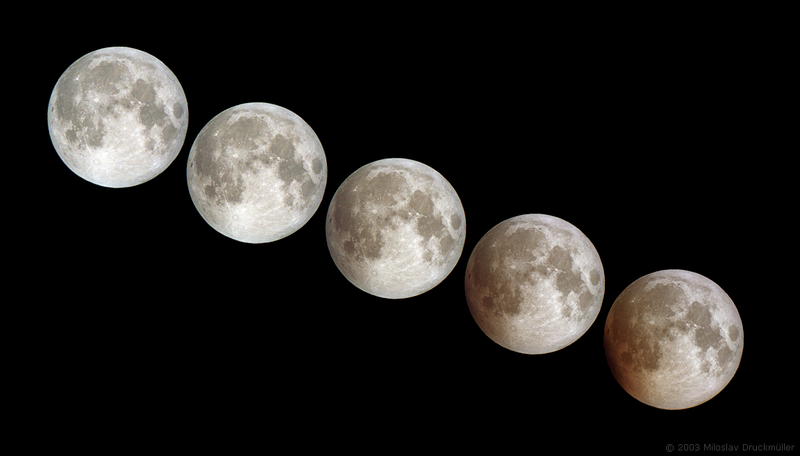 The last picture of the sequence was taken about 80 minutes before the moonset. Click on the image or on the following reference to display the higher resolution image version (340 KB, PNG format). Processing Picture taken just before penumbral eclipse start was used for color calibration (Full Moon was defined as gray). The same calibration was used for following pictures.